Happy Saturday, I hope you all had a great week! I’ve been in Berkeley, California all week shooting my new cookbook with photographer Eva Kolenko, I can’t wait for you to see the photos! *NOTES: 1 Green salad includes 5 cups romaine, ½ cup each: carrots, tomatoes, cucumber, chickpeas, 2 scallions and ½ ounce shaved parmesan. I can’t find the google doc link for the calendar printout. Can I please get a link? It is below the calendar. Thank you so much for all these lovely recipes I’m so grateful that you take time out of your day to prepare these meal Preps for us something you don’t have to do. A lot of people say they want to help but they want to charge you to help you but I just want to tell you thank you so much for putting this out here for free you really don’t know how much you’re helping people. Thank you, thank you, thank you! I am so happy they are helpful! 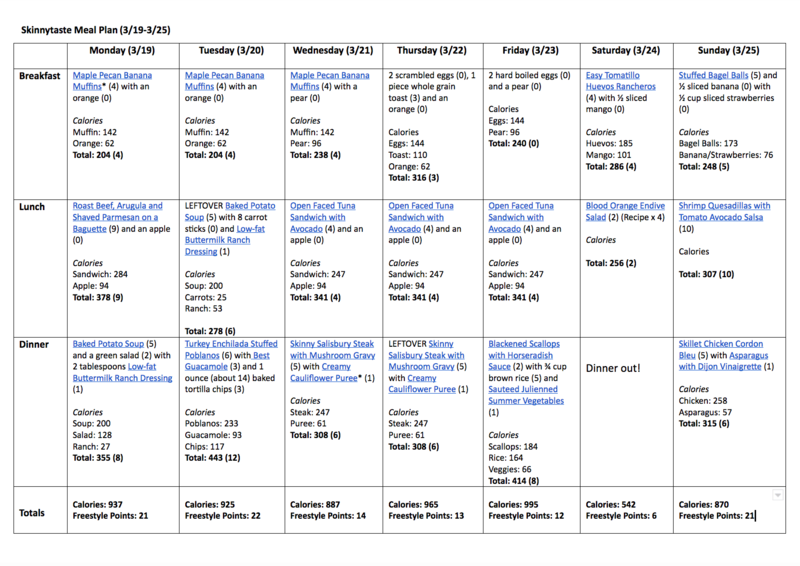 I just came across your website and love the weekly meal plan! I definitely plan on using it! The recipes look amazing! Seriously, this is the nicest thing ever! I’m a 41 year old mother who gets weary of cooking and planning every week. What a boost to discover your plans. Can’t wait to try. Thank you so much!! Love your meal plans!! Please continue to share! They make it so much easier to stick to my daily calorie goals. I love your recipes! Thank you for including the updated Weight Watchers points! I just found this site this week and I am soooo excited !! I am trying to loose 15 lbs and I am following your weekly meal plans along with the Lose it app (not to a tee but plan to make 3-4 recipies each week). It is awesome to finally find some creative tasty recipies that are also healthy/low-fat -so THANK YOU!! I just found this site this week and I am soooo excited !! I am following your meal plans along with Lose it app (not to a tee but plan to make 3-4 recipies each week). It is awesome to find some creative tasty recipies that are also low-fat -so THANK YOU!! I am determined to start your plan this week! I’m excited to see the changes in my husband and myself. We are both at an age where we need to start watching what we eat. Thank you for your enthusiasm for encouraging others to follow a more healthy lifestyle. Stay blessed! I have been stalled on WW and getting a bit bored with my meals. These meal plans look delicious and will definitely shake things up! One question: is there a way to print all the recipes at once or do you go recipe by recipe? Thank you for providing all these recipes! On Wednesday, the open faced tuna sandwich link goes to the guacamole recipe. Do you have the recipe for the tuna sandwich? if you use the yummly app, you can add the recipes you want to make, then it will create a shopping list for you. The meal plans are great! I am starting by doing a few meals. Its hard to commit to buying for entire week when not sure how meals will be received. So far all have been enjoyed! Appreciate your sharing. I love your plans, the print outs, and the grocery lists. Thank you for making things so easy!!! Is there any way to get the weekly meal plan calendar as an attachment so you can edit it if you swap recipes out? Thank you for posting! These are very helpful and help me stay focused! i am so excited there is going to be another cookbook – what is the timing on the book? Thank you for the fantastic meal plans and recipes. And my doctor thanks you too because I am so much healthier after just 2 months of following your meal plans and cooking your delicious recipes…16 pounds and counting. You’re a genius Gina! This meal plan looks amazing. I’m so excited to get to work. Just found your website and meal plan menu. Can’t wait to try some of these out! I absolutely love your website and the meal plans. They are valuable in my meal planning. It makes it so much easier! Thanks for posting these meal plans! I don’t follow them exactly but pick meals that work for my family. I have discovered so many new healthy meals that I love thanks to you. Keep them coming! Love your meal plans. Especially if they have instant pot recipes. I used the meal plans to create great meals. Along with other recipes from your website. Makes meal prepping a lot easier and making dinner on the quick easy. I lost all my weight using your site and recipes and then sadly stopped and started gaining until I am almost right back where I started. However I decided on Friday to get back on track and read this article. I am so pleased to see you providing meal plans! That is amazing. Super helpful for those of us with busy schedules. Now I don’t have to research hours a week finding things that will work within the points plan, I can just pick from your plans and go. Thank you so much! I love your meal plans and recipes! I really appreciate these weekly menus and recipes. You’ve made my life and losing weight so much easier. Thank you for all you do! Thank you SOOO much for sharing with everyone. Love your menus. Use them every week. I am enjoying the new format with all the meals planned out. Thank you so much. 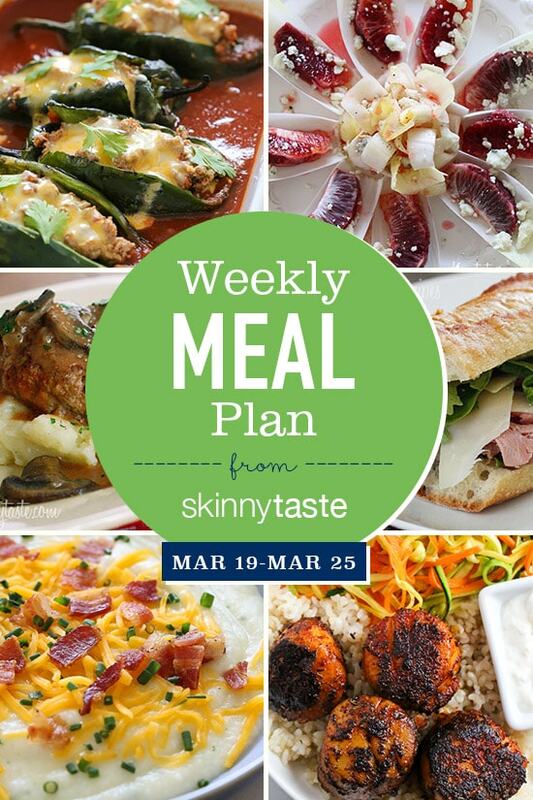 Thank you for sharing your weekly menu plans. I find them so useful for recipe ideas even though I may not follow them religiously. Please keep sending them through! The shopping lists are great too. Thank you so much for posting these. They have been so helpful for me and my family! I am also using them for weighloss. 🙂 THANK YOU!!! Love this set up! Lost 30 lbs using this website. I make your meals every week and look forward to new posts. Thank you for posting!!! I use these every week! I started counting calories about two months ago and have lost 12 pounds. I have three to go to get to my goal weight! Thanks again!